I have been in Brussels just over a week now and, unsurprisingly, Brussels does not quite feel like home yet. But I am sure things will feel different once my boxes from Rome have arrived (which should happen some time next week), my cookbooks are crammed into my bookshelf and I actually have a sofa to sit on. Until then, I will bake scones. Scones are easy and if there is anything that can make you feel at home then it is eating a freshly baked scone slathered in butter and jam (even if you are eating your scone standing in your kitchen as your flat does not yet have any chairs or a sofa). The first thing I had planned on baking in my new kitchen wasn’t these scones or anything sweet at all. Instead, I wanted to bake bread, a variation of the kamut and polenta bread I posted a while ago. But when I wanted to weigh my ingredients I realised I had accidentally bought baking powder instead of dried yeast. However, I did have all the ingredients to make scones. For me scones are the perfect mid-week indulgence – they taste like lazy Sunday mornings yet are quick enough to prepare even on a busy weekday morning. In fact, I like to think I have my mid-week scone routine down to a pat: I switch on the oven to pre-heat and assemble my ingredients as soon as I stumble out of bed. While I wait for my coffee I prepare the dough and once the coffee is ready I slide the scones in the oven. As soon as I am out of the shower, the scones are ready to be taken out of the oven and the time it takes me to get ready is the perfect amount of time for the scones to cool down enough so I can eat them without burning the roof of my mouth. I play around with my basic scone recipe quite a lot – the beauty of this recipe is that it is so forgiving – you can throw in some fresh or oven-roasted fruit, dried fruits or nuts or use different flours – so feel free to adapt the recipe to suit your preferences or what you happen to have in your pantry. Note: If you don’t have einkorn flour, feel free to use spelt or wholewheat flour. The goat yoghurt is what I had to hand but I normally make the scones with plain cow milk yoghurt so just use what you have. Lastly, although these scones look rather wholesome they are in fact pretty sweet thanks to the addition of the dates. To enjoy them on their own I think the level of sweetness is just right but if you want to eat them for breakfast, maybe with a little honey or jam, you might want to half the sugar or leave it out entirely. The scones will taste best on the day they are made but will keep fresh for a couple of days. Pre-heat the oven to 180 degrees Celsius and line a sheet pan with parchment paper. In a mixing bowl whisk together the flour, baking powder and salt. Add the cubed butter. Rub the butter into the flour until the mixture resembles sand and you can no longer see any large chunks of butter. Add the chopped dates and stir to combine. Pour in the yoghurt and knead the dough just long enough for it to come together into a shaggy ball. Shape the dough into a rough ball, set in the middle of the parchment paper and carefully roll out to a disk of ca. 2-3 cm thickness. With a large knife divide the disk in four triangles. Brush each triangle with a little bit of milk and bake for ca. 18 minutes or until risen and just starting to colour on the edges. Your scones are gorgeous, I love the combination of dates and goats milk yogurt. I have never baked with Einkorn flour. Must try. Thank you! I love Einkorn for its flavour and colour and use it interchangeably with spelt flour whenever I can get my hands on it (luckily, here in Brussels my local organic store stocks it). These scones looks delightful, love the addition of dates! Interested in trying out Einkorn flour – I wonder if it is gluten free? Krys – unfortunately Einkorn is not glutenfree. It is an ancient form of wheat which some people find mor easily digestible than modern wheat varieties but unfortunately it does contain gluten so is not suitable for coeliacs. These sound lovely! I really like the idea of the little nuggets of date running through them. Thanks Kathryn! 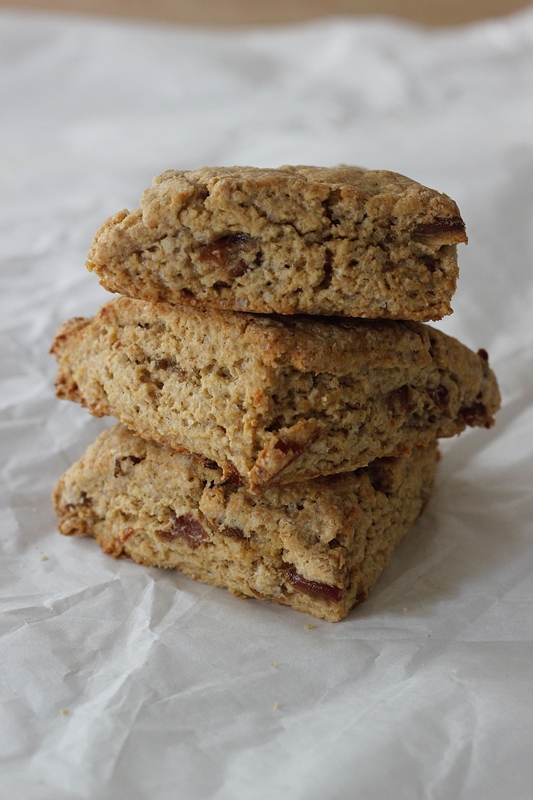 The little nuggets of dates are the best thing about these scones!